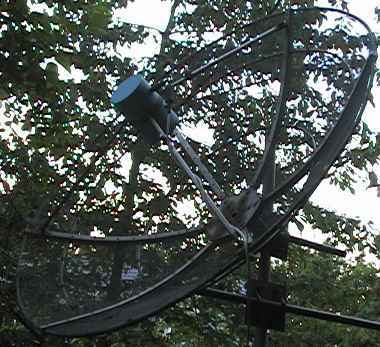 A key component in any weathersatellite reception system are the antennas. For HRPT reception I tried two types of antennas: Helical Beam Antennas and Dish Antennas. I started HRPT reception by constructing a Helical Beam Antenna following Arne van Belle's design.This antenna does not occupy too much space and promises enough gain for HRPT image reception. Always trying to obtain somewhat better results than my predecessors, I made a small modification to one of the details of Arnes dimensions. Instead of a diameter of 60mm for each turn I tried a diameter of 63mm. The reason for this modification beeing that any software available for helical beam calculation promises higher gain with larger diameter ( within certain margins of course ). Results were disappointing, but why ? I searched the web until I found a short research note from Darrel T. Emerson about his modelling studies of helical axial antennas. One of his interesting results is, that gain for large helical beams significantly drops when using too large a diameter for the turns. He also writes: Note that the radius at which peak gain occurs decreases with antenna length. So I started my next trial, now with a diameter of 59 mm for each turn. And yes, results were much better......But not good enough in my opinion since HRPT images still contained too many noisy lines and speckles. Partly this may be attributed to the real gain of ( my ? ) 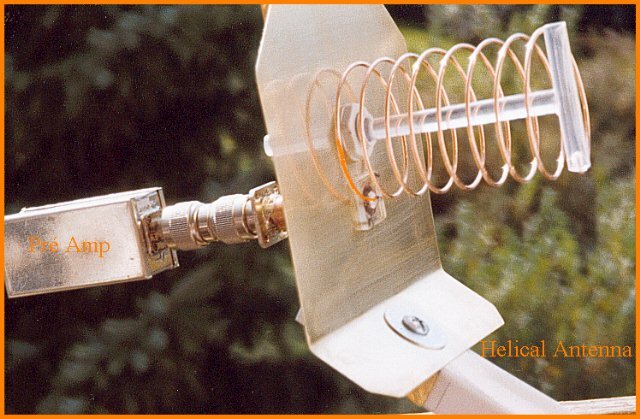 helical antenna ( Darrel T. Emerson states: In summary, this extensive modelling study is in good agreement with theory and measurement from the professional literature, all of which show that the simple Kraus formula for gain of a helix is far too optimistic - by up to 4 or 5 dB. ) partly to the location of my antenna. Our house is surrounded by some buildings and some very large trees occluding sometimes direct line of sight to the satellites. My first start with dish antennas for HRPT image reception was by using a 60cm prime focus dish and an Inmarsat feed I had in one of my junk boxes. To make a long story short: easy to build ( much easier than a long helical beam ) and much more gain than the Helical Beam Antenna, although the feed is supposed to be optimised for a frequency range some 50 to 100 MHz lower. Having tried this and still wanting more gain ( remember the trees ) I pulled out the original Inmarsat dish, a prime focus dish with a diameter of 85cm manufactured by Magnavox. As expected this gave even some more gain. During some bad weather period I had the chance to test the mechanical stability of my antenna setup. Since it survived, I became more trusting. My antenna set up with mast and rotors did withstand the windload of an 85cm dish antenna. So I could proceed to further optimize my dish antenna and antenna feed. After reading Paul Wade's online antenna book , I decided to give an offset dish a try. 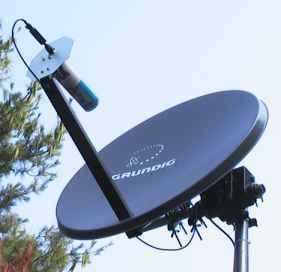 The advantage of offset-fed dishes is that the feed does not block the beam as is the case with prime focus dishes. My first start was by using a helical feed similar to that described by Howard G6LVB with consideration of his addendum which suggest a turn count of 5 to 6 to be optimum. Actually the result was not convincing, not really better than the Inmarsat dish with its feed. Next try was to use a feed as described by Harrie van Deursen. 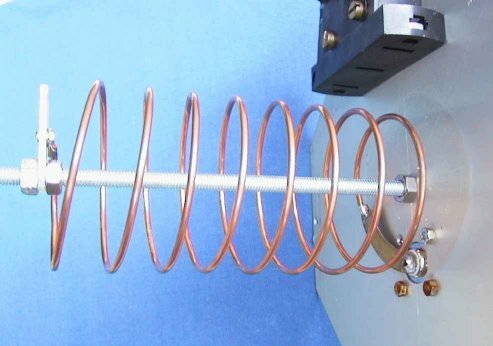 This feed is somewhat unsusual in that it proposes a turn spacing of about 12mm, much less than the standard dimension of helical antennas with a turn spacing of about one quarter of a a wavelength ( some 40mm in our case ). The result ( so far ) : Harries design is clearly the winner although I did not copy his method of impedance matching but rather used the circular quarter lenght method from Arne's Helical Beam Antenna. One drawback I noticed: circularity is not as good as with "Howards" feed. See below a picture of my current installation of an offset dish with Harrie's feed. ( my AJAX feed -- for weather proofing I put the feed into a plastic can that formerly contained some detergent ). Preamplifier is Vidmar's design ( see preamp page ). Next tests will be a greater number of turns for the feed and some lager spacing of turns. I will report my results here. My dish antennas for Meteosat HRI image reception ia a 135cm prime focus dish with a coffe can feed. This antenna is buried among large trees, so HRI signals are really marginal. Receiver equipment is the same as for NOAA HRPT. Due to the move of Meteosat-7 to 57° East this antenna is out of duty now, but I do receive a weak carrier on 1691 MHz of LRIT transmissions from Meteosat-9. If any DIYer is out there, developing an LRUS (LRit User Station), please give me a note, to see how it can be done.